The seminar is suitable as well as for „beginners“ as for people with more experience. During the seminar, we will have one free day for excursions or just to relax. But also on the seminar days, there will be enough time for relaxation, leisure, holiday fun or a great massage in the SPA! In the first half of the seminar we focus on arriving and letting go all the stress of our daily life. We will also focus on the target to become more aware of the own body and be totally present with the soul. We achieve this by laughter yoga, breathing exercises, meditations, dynamic exercises, energy and chakra work. The second part of the seminar will be focused on creating new visions. We will celebrate tantric rituals, touch, joy of life, fun, perception of senses and sensual encounters. Sunny weather, green landscape, blue sea, colors everywhere (blossoms, flags, scarfs and clothes), a very close connection of the Balinese people with the hinduistic religion – as a visitor you can feel close to heaven being on this island. With the fantastic resort in the middle of a coconut plantation and with its luxurious villas, the outstanding food and the most beautiful seminar room we ever saw, the circumstances are also like in paradise. 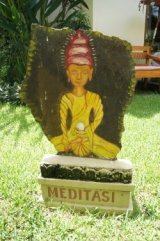 The seminar program with tantric flower rituals, sensual massages, powerful meditations and exercises as well as the deep connection with the other people in the group let us finally feel like “in heaven”. In addition to the seminar itself there will be the option for some more common leisure activities: a dolphin boat tour (included), spending time together at the swimming pool or go swimming into the sea. There will also be the possibility to take part in the yoga lessons offered by the resort. And in the SPA you will receive the best massage ever! Beginning of the seminar: Tuesday December 5th after dinner. End of seminar: Monday December 11th with the farewell party in the evening. Accommodation: € 395,00 (half pension in double room during the seminar week, single room addition € 542,00). Included: 1 Balinese Massage, Sunrise Dolphin Boat Tour. Not included: flight, transfer and other leisure activities like excursions etc.. Please book the flight by yourself (destination: Denpasar, Indonesia). If you need support, we are in cooperation with a travel agency and can help you with the booking. Transfer from airport will be organized for you. Please send us your flight dates after booking.